Due to a schedule conflict, I didn’t attend Interbike, but tuning in from afar, what I noticed is that it seems like anyone drawing a salary from a bike brand is lockstep with motorization. That includes magazines and outlets that run ads from those brands. I can proudly tell you we’ve never ran any brand ads, since we started more than a decade ago. I expect within 2 seasons the marketers will glorify a return to the basics of non motorized bikes and maybe some further innovations around adventure and gravel will go to market. For now though, the news is about motors and batteries. 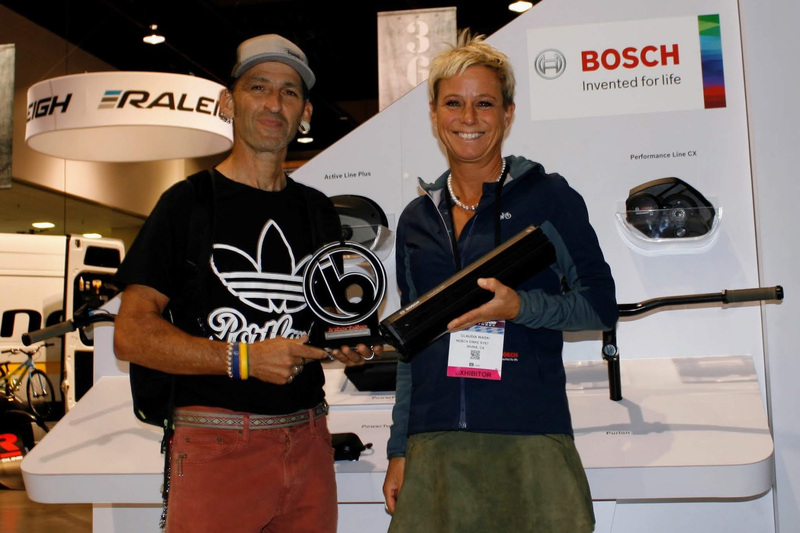 Here’s Zap awarding Bosch an Innovation Award for their PowerTube 500. That’s an power pack shaped to integrate with a bike tube instead of being bolted onto the frame like this Yamaha. If you’re into ebikes, the PowerTube stores 500 watt hours and weights only 6.2 lbs (about 3x what my gravel frames weighs). And, it’s already spec’d on bikes from Bulls, Cannondale, Cube, Fuji, Gazelle, Haibike, Mondraker, Raleigh Electric, Riese & Mueller, and Trek. Where I find ebikes most useful is for cargo and transporting kids around town. The updated GSD features a 500 watt battery too, but not in the tube form.